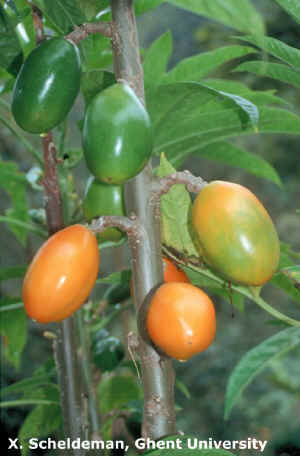 Common names : Sp: toronche, chamburo, yumbo papaya, berenjena (Ecuador), col de monte, peladera, col de montaña. Origin and geographical distribution : Subtropical parts of eastern Andean slope (600-1700 m) of Ecuador, Peru and Bolivia. Description : Semi-lignose, shrubby plant, height to 3 m, propagated by seeds; leaves lobed, flowers white, plants monoecious, fruit ovoid, shiny orange at maturity, 7-8 x 4-6 cm; few big crested seeds. Uses : Edible fruits; cooked or fried, or prepared with milk. Little aroma. References : Badillo, 1993; Van den Eynden et al, 1999; Scheldeman et al, 2000; Badillo, 2000.